Blue tongued skinks are quite and gentle, and quite easily tamed and handled. It is reported that even wild blue tongued skinks will sometimes allow themselves to be picked up without a struggle. 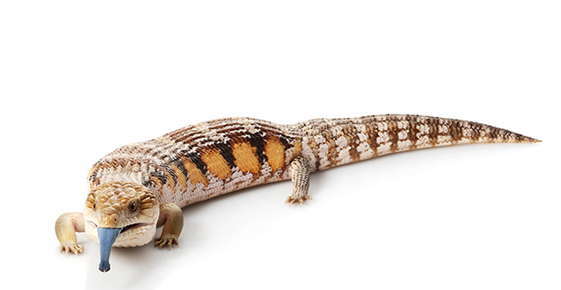 Popular as pets, blue tongued skinks or "skinks" are moderately sized lizards native to Australia. They live in a variety of habitats, including grasslands, forests, rainforests, and deserts. They are now found all over the world as pets. They are not inexpensive to care for as they have, like many other lizards, strict nutritional and environmental requirements that need to be met for them to thrive. Fairly large at mature size of around 20 inches (snout to vent length of 12 inches), a good sized tank/cage will be required. The expected life span of a blue tongued skink is anywhere from 10-20 years, although with good attention to nutrition and the ideal environment, the high end of that range should be expected. However, they are social and easy to tame and handle, and show a range of fascinating behaviors that make them interesting to watch. Need a large enclosure such as a 40-55 gallon tank. Being ground dwellers they don't need branches for climbing, but still need a secure lid. Substrate: aspen wood shavings, cypress mulch, or even newspaper. Make sure they are not ingesting wood substrates. Temperature: gradient from 75-85 F (24-29 C) with a basking spot of 95 F (35 C). A combination of undertank heating and a basking light on one side of the tank works well. Make sure the appropriate temperature gradient is provided by measuring temperatures in various spots around the tank. Night temperature can drop to about 70 F (21 C). Water: provide a large shallow sturdy water dish. Skinks like to bathe in their water but often defecate there so frequent cleaning is required for the water dish. Hides: a couple of sturdy hiding spots should be provided for skinks, which like to burrow and hide. Cork bark, wood, rocks, PVC pipes, or other hides can be used. Make sure wood pieces or rocks are firmly places so they will not fall on the lizard. A humidity hide (e.g. a plastic storage box with moss or cypress mulch to holds moisture) will help with sheds. Skinks are true omnivores, which should be reflected in their diet. Variety is the key to providing a nutritious diet, and a calcium/vitamin D supplement should be added to the food. Vegetables/fruits: beans, summer or winter squash, carrots, parsnips, leafy greens. Can be shredded or pureed and added to meat portion of diet. Fruits can include strawberries, bananas, melon, etc. Meats: low fat canned dog food is a good staple in the diet. This should be supplemented with other items such as superworms and pinkie mice (larger for adults).